I promise there is a recipe contained in this post. I need to get something off my chest first though. Hang with me. There’s this person I know. I don’t like him at all. Not one little bit. He’s been horrible and awful to someone I love a great deal and I’d like to teach him a lesson. Actually, I would really like to — well, what I’d like to do is complicated. Izma can explain it better than I ever could. I love fudge. I absolutely love it. This recipe is straight off the back of the marshmallow fluff can. I’ve been making it for years. I do one small thing differently. In addition to the normal semi-sweet chocolate in the recipe, I add about 2 ounces of milk chocolate chips. Perfect chocolatey goodness. I am anti-nut in my baked goods, but if you like chunky nutty fudge, just add 1 cup of your favorite nut, chopped. Tonight, I was supposed to be making phallic shaped candies for my sister’s bachelorette party tomorrow night. But, I found out my cousin Shannon is making similarly shaped cookies, and felt that the candy molded “members” would be a little redundant. So, I made these babies instead. I combined parts of three recipes and added my own twist to come up with this awesome bite sized cookie with a name that almost sounds like…I dunno – like a profane exclamation. Which you might want to shout out when you taste them. They are that good. Sift together the flour, salt and baking soda; set aside. Cream together the butter, sugar, peanut butter and brown sugar until fluffy. Beat in the egg, vanilla and milk. Add the flour mixture; mix well. Shape into 40 balls and place each into an ungreased mini muffin pan. Bake at 375 degrees for about 8 minutes. 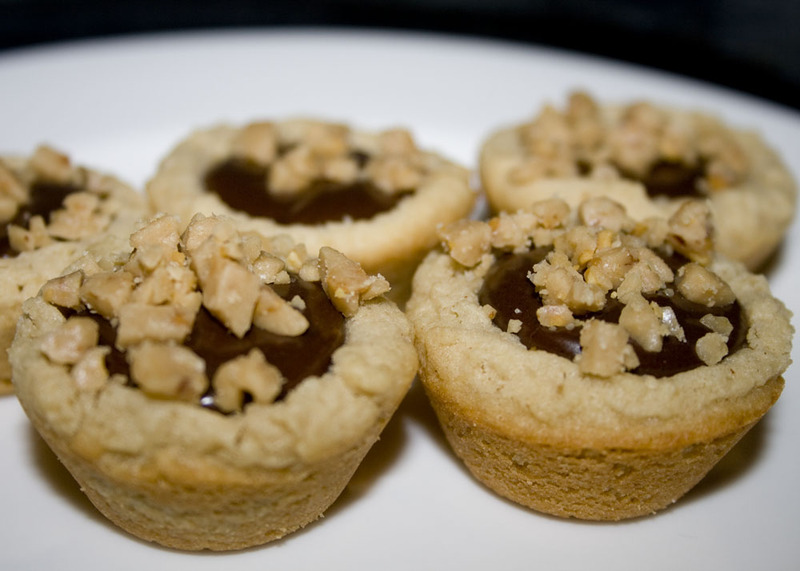 Remove from oven and immediately press the back of a teaspoon into each cookie, creating a well. Cool 10 minutes in the pan then carefully remove to a cooling rack. Once all cookies are made and removed from the pan, start your filling. For Filling: Put chocolate chips in a double boiler over simmering water. Stir in milk and vanilla, mix well. Place a large ziploc bag in a tall glass, fold plastic over the glass and fill with chocolate fudge filling. Seal bag and snip corner – wrap bag in paper towel or hold it with a hot pad as the bag will be warm. Fill each well with chocolate filling and top with toffee chips.